Life with the Lashers: It's a Girl! For some reason I thought I had updated our blog in regard to our last OBGYN visit, but apparently not. I apologize for keeping everyone in suspense, but we've been busy with out of town guests and Thanksgiving! As you can see from the title of this entry, we are expecting a little baby girl. 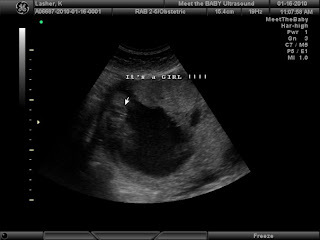 According to the ultrasound technician, there's a 90% certainty that our baby is a girl. She is still in the breach position and wasn't very cooperative the day of the ultrasound, but the U/S technician is fairly certain our baby is a girl. We have some U/S pictures, but they aren't very flattering to be quite honest. I've been contemplating scheduling a 3-D/4-D ultrasound at a place called Meet the Baby in hopes of obtaining some better U/S pictures. According to the U/S technician, she is developing as expected and appears to be in good health. We have an appointment this Friday with OBGYN as part of my routine prenatal care and to discuss the U/S. I have some questions about my due date because I've heard conflicting dates. At the first U/S we were told April 8th, then at the second U/S we were told April 20th and at our last U/S we were told April 17th. I keep telling myself that just as long as she is born healthy, she can stay in there for however long she would like. Personally, I would like to know for planning purposes what the doctor thinks the due date will be. Obviously the due date is not up to the doctor or me, but rather our little girl. If she's anything like Ian or myself, she will make her entrance into the world a few days sooner than expected, considering we both were born a few days before our due dates. Sadly, we will be returning to work tomorrow, after a 5 day mini-vacation. We've both enjoyed our time at home and have completed many items on the to-do list. We spent time with family and friends, which is very important to me during the Thanksgiving holiday. Our house is decorated for the holidays and it's beginning to look, smell and feel like Christmas/Hannukah around our house. We put up the artificial Christmas tree this year because we won't be in town for the holidays. I'm a little disappointed that we don't have a real tree, but the tree looks great and we don't have to worry about watering it everyday. We leave for Baltimore in a little over three weeks and I'm really looking forward to this trip. We didn't go to Baltimore for Christmas last year and it just wasn't the same, so we decided to head up north this year for Christmas in Charm City! Kaiser and Riley will be joining us, which makes the trip extra special. Normally we fly Airtran because they allow small dogs to fly in a pet carrier, under the seat, but we've decided to try Southwest. Southwest now allows small dogs to fly in the cabin, like Airtran, so the boys will have their first flight on Southwest. It's going to be a great Christmas! Well, that's it for now... enjoy the rest of today and GO RAVENS!! !